TheCityFix is coming to you live from Mexico City this week, where EMBARQ Mexico is hosting the 11th annual International Congress on Sustainable Cities and Transport (“XI Congreso”) today through Wednesday. The conference is aimed at helping cities work toward a sustainable future. The first day of the conference was filled with workshops and sessions touching on a variety of issues, including urban mobility, building efficiency and urban development. Over the course of the day, three topics in particular were discussed at length: the impact that sustainable efforts can have on city dwellers, the importance of collaboration and the role that cities play in encouraging the rest of the world to implement change. Designing safer, more sustainable cities has an endless list of benefits. In addition to reducing traffic fatalities, improving air quality and implementing sustainable urban mobility, the community’s connection to the city is strengthened when smart choices are made. Collaboration was discussed as a key to creating more sustainable cities. Participation from organizations, consultants, the private sector, governments and local politicians is vital for creating and implementing change around issues such as energy, urban planning, transportation, and building efficiency. Encouraging diversity in the decision making process is key. Cities should seek participation from people of all backgrounds, especially those impacted the most by the decisions – the community. Facilitating the exchange of information and resources can help our cities of today become the leaders of tomorrow. By having a deep and thorough understanding of the current situation, city officials can uncover the best solutions that benefit the city as a whole. With COP21 just around the corner, now is the time to work together to tackle issues such as climate change. Cities have a large role to play in this challenge, and with the help of local officials, can help set the stage for change at a broader scale. Initiatives such as the Compact of Mayors are bringing together city leaders from across the world to help take action at the urban level. By leading the way in confronting the most pressing environmental issues of today, cities can show countries the tremendous impact that action can have. Successful programs and policies can be used to show national governments that these changes can and should be scaled up to a higher level. 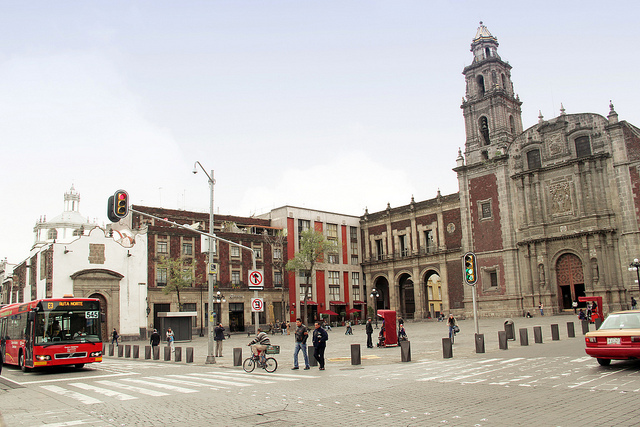 Follow the conference online at #CiudadesyTransporte, @Congreso_CTS, @EMBARQMx, @WRIcities, TheCityFixMexico and watch the keynote sessions live online from Mexico City’s World Trade Center.